How to Manage your Wet Bio-degradable Waste – A Comprehensive Product Guide. A comprehensive product guide for processing wet bio-degradable waste in Apartments and Gated Communities – by Wake up, Clean up Bengaluru. The guide helps apartments and gated communities with options and list of providers to implement the recommendation of in-situ processing of wet waste with in the apartment complex or gated communities. Answers to frequently asked questions on why Apartments should process their own waste are also present. 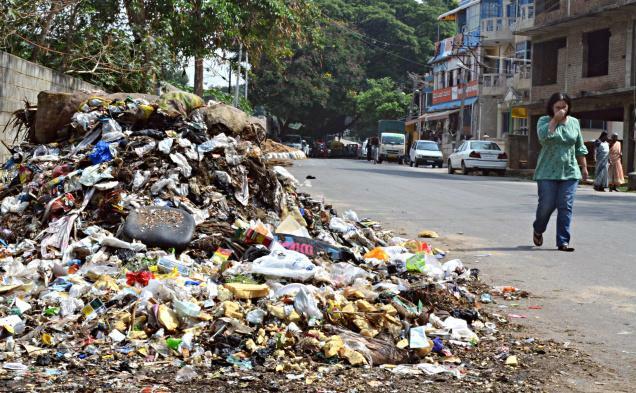 The Bruhat Bengaluru Mahanagara Palike’s new Solid Waste Management policy seems to be more of a knee-jerk reaction than a well thought-out plan, as it passes on the task of waste management to the general public without outlining clear solutions for the existing problem. Apartment owners, in particular, have been badly affected by this new plan as apartment complexes have been labeled as ‘Bulk Generators’ by the BBMP, along with malls, shopping complexes, public offices, and convention halls. So what does this mean for apartment owners? It means that any apartment with more than 10 housing units is solely responsible for handling its own solid waste, and should have composting units to process the waste internally. Apartment owners now have to worry about installing and maintaining waste processing units, mainly due to an inconsiderate plan that has been cooked up overnight! The new policy being rolled out by the BBMP is unfair to apartments mainly because apartments now need to be equipped with composting units out of the blue. This is hard, primarily due to the following factors. Most apartments in Bangalore have a predefined structure, with the entire area neatly sectioned according to the building plan. The need to accommodate a composting unit has thrown up a key problem in such apartments, which is the lack of space. Residents in apartments from across the city are also irked as apartment associations weren’t consulted while this plan was being formulated, leading to widespread confusion on how these measures can be implemented. Composting units, even if installed, need to be verified and checked to ensure that they adhere to the prevailing standards. Sewage treatment and composting units in Bangalore need to be verified by the Karnataka State Pollution Control Board (KSPCB) and the contractors need to be duly approved – but this is a factor that has not been distinctly outlined in the new SWM plan. The plan doesn’t get into the finer details of which authority residents should consult while installing an STP or composting unit, or whether it is ecologically safe to have such units in a residential area. Apartments with garbage processing plants will generate huge quantities of compost too, and no plan for managing this widespread generation of compost has been specified. The Bruhat Bengaluru Mahanagara Palike (BBMP) has also not specified any waste management process for residents to follow, with clearly outlined steps like segregation, disposal, or recycling. STPs and composting units need to be rigorously maintained, so the added cost of installing and maintaining these units will be passed on to the residents. Residents state that apartments need to spend INR 150000-200000 in order to run these composting units, and this will prove to be particularly expensive for smaller apartments that have fewer houses. Residents who can’t install a composting unit need to pay the BBMP a standard fee to dispose their solid and wet waste, which is an additional expense that all residents should be willing to bear. Apartment owners view these rules as particularly unfair as independent houses and smaller apartments face none of these costs when it comes to waste management. Is The BBMP Passing The Buck To Bangalore’s Citizens? Legally, the BBMP is directly responsible for waste management and garbage collection in Bangalore, under Schedule II of the Municipal Solid Wastes (Management and Handling) Rules. This is clearly defined under the rules set by the Ministries Of Urban Development and Environment and Forestry, which state that the BBMP should collect domestic, institutional and trade waste from the source, from every door or through a community bin. The corporation is also authorized to employ NGOs and private companies for help. 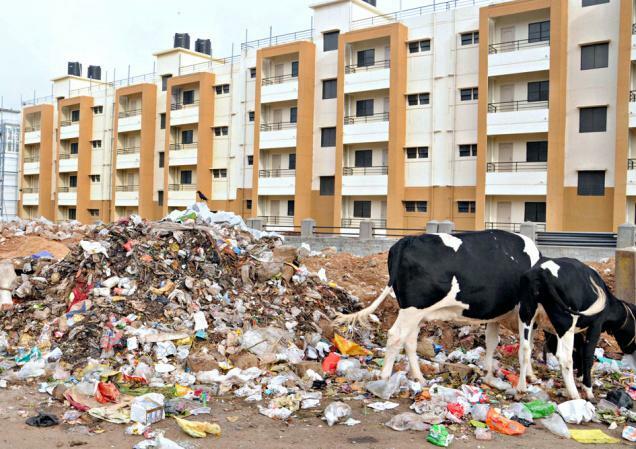 By making apartment residents accountable for waste processing, the municipal corporation is not fulfilling its fundamental duty of maintaining the civic assets of greater Bangalore. In an analysis that deconstructs the SWM problem, Mr. Narayan Aras, one of the central figures representing the plight of apartment owners, states that all that residents need to do (as per the law) is initially segregate their dry and wet waste and keep them ready for the BBMP to collect. It’s not yet clear if the corporation has the authority to pass on its duty to the residents. Certain residents are also worried that the introduction of private contractors into the picture will lead to the rise of garbage mafias that dictate varying charges for the collection and disposal or garbage. Apartment residents are likely to be at the mercy of these contractors, as failing to comply with the government’s rules can lead to basic amenities like electricity and water supply being cut off. Mr. Aras has also stated that the term ‘Bulk Waste Generators’ that the BBMP has attributed to apartments is not an official one, as it does not feature in the Karnataka Municipal Corporations Act (1976) or the Municipal Solid Wastes (Management and Handling) Rules (2000). This has apartment owners to question the conception and implementation of this new SWM plan. Bangalore needs carefully planned waste management measures that are sustainable and devised with the city’s future in mind. With migrants pouring in and the population steadily increasing, only efficient long term plans can help in making the city a metropolitan haven. Going by the current draft of the BBMP proposal, the road ahead seems to be a very long one. This article is based on the inputs provided by Mr. Nagesh Aras of Sobha Aquamarine, Sarjapura Outer Ring Road, Bangalore who has been leading the STP related regulations for Apartments with KSPCB and now on the SWM rules. This article is to benefit the readers of our blog to get different perspective of problems that Apartment Complexes grapple with every day. The article does not necessarily indicate views of ApnaComplex. This article is based on interview with Mr. Nagesh Aras of Sobha Aquamarine, Sarjapura Outer Ring Road, Bangalore who has been leading the STP related regulations for Apartments with KSPCB and now on the SWM rules. When the Bruhat Bangalore Mahanagara Palike (BBMP) framed a draft of its new Solid Waste Management (SWM) plan in late 2012, there was a collective sigh of relief as the policy was seen as the much awaited first step towards a cleaner Bangalore. But a deeper look into the tenets of this plan throws up critical questions on the role of apartment complexes in this SWM drive. The new recommendations hold apartments responsible for processing their own solid waste – a move that has evoked strong reactions across the city’s apartment associations. So where exactly do apartment complexes fit into the current scheme of things? More importantly, how do the new regulations affect apartment owners? Improper waste management is a problem that has plagued Bangalore for over two decades, and the issue hit the spotlight again when the BBMP’s act of dumping solid and wet waste (without proper segregation) in the village of Mandur started causing ecological problems in the locality, along with rising health hazards. Close to 500 trucks loaded with 3000 tons of garbage from the city were regularly sent to the Mandur landfill on a daily basis, till rising tensions prompted the Bangalore High Court to intervene and stop the BBMP from using its landfills entirely. 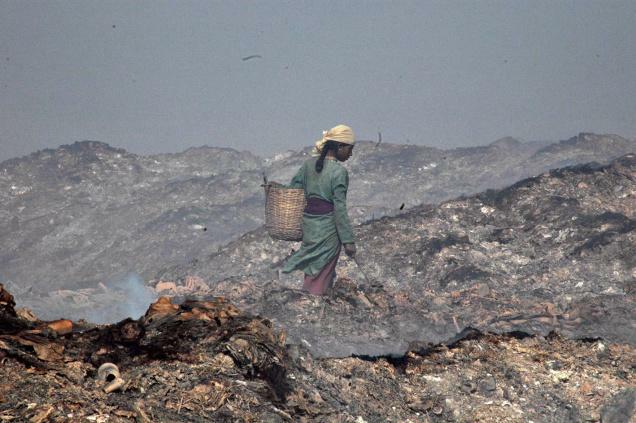 The growing mountains of waste in the landfill and the ensuing diseases prompted the villagers from Mandur to protest against the BBMP in the year 2012, bringing the entire cycle of waste segregation and disposal to a halt, and leading to the accumulation of excess waste along the city’s roads. The revised waste management plan is part of the BBMP expert committee’s efforts to outline a clear cycle of waste segregation and disposal within the city, with an eye on the growing population and the mounting need for better waste management facilities. Although the new SWM plan mainly outlines the need for proper waste segregation at all levels of the disposal cycle, certain key statements in the plan dictate that residential complexes and apartments are solely responsible for processing their own waste. Under the SWM plan, which was announced in September 2012, residential apartments that have more than 10 housing units or above have been classified as ‘Bulk Generators’ of waste, along with hotels, malls, shopping complexes, public offices, and transportation terminals. The BBMP regulations clearly state how different types of wastes should be handled by the apartment management. Dry Waste: This includes waste materials like plastic, paper, metal objects, wood, rags, rubber, and thermocol. Dry waste should be handed over to the nearest collection center. Wet Waste: Wet waste includes uncooked and cooked food items, and compostable material. This should be processed through composting units or given to the BBMP for a fee. Sanitary Waste: Sanitary napkins, any material contaminated with blood, and disposable diapers fall under this category. These need to be disposed at biomedical waste collection centers. Inerts And Rejects: Road sweepings, silt, dust, ashes, broken glass, and construction and demolition wastes are part of this category. Inerts will be collected from apartments on a weekly basis, again for a standard fee. More than a third of Bangalore’s residents live in apartments; and this unexpected move from the BBMP expert committee has spurred debates on how effective these efforts are. In fact, Mr. Narayan Aras, who is leading the efforts to educate apartment residents about the new SWM plan, has compiled an analysis on why the BBMP’s recent measures are impossible to implement. The new policy has come under criticism mainly because these long-term regulations have been passed overnight without providing residential complexes the space to learn about and install such composting units within the complex. To add to this, there are no fully functional KSPCB (Karnataka State Pollution Control Board) approved disposal centers across the city, complicating the entire waste disposal process. Many planned apartment complexes don’t often have the space to accommodate these units, and the BBMP’s lack of operational support in terms of setting up and approving these units is an important factor as well. Installing and maintaining a composting unit is an additional expense that apartment owners will have to bear, and these are just some of the many reasons why apartment residents can’t process their own waste. In an ominous move, the rules also specify that housing units that don’t adhere to these new regulations will have their electricity and water supply cut off, with a looming threat of nonconforming residents being forcibly vacated or imprisoned too. It remains to be seen if the BBMP will listen to protesting homeowners who are challenging the components of its ill-advised draft.